We take "texting" for granted today as new technology; however, wireless texting has been in use since early radioteletype experiments dating back to 1922. Radioteletype technology was put to use by the US military in 1930s and use expanded during World War II. 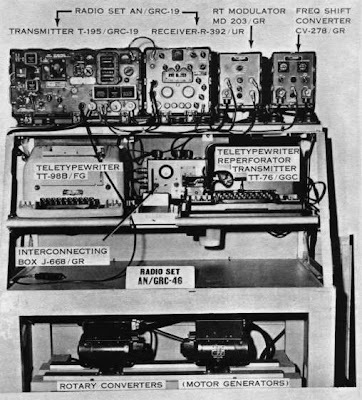 The US Navy called radioteletype RATT (Radio Automatic Teletype) and the Army Signal Corps called radioteletype SCRT (Single-Channel Radio Teletype). The AN/GRC-46 operated on HF (1.5Mhz to 20Mhz) and employed Frequency Shift Keying (FSK) for either half-duplex or full-duplex RTTY tactical communications (up to 80km). The radio could also be used for CW and phone operations. One interesting feature was the ability of the operator to simultaneously transmit both RTTY and phone. Funny to think that this was state-of-the-art for portable "texting" device at the time. The film runs about 27 minutes.